Striking, robust and oh-so-stylish; the Raw Concrete Tapered Outdoor Dining Table is an excellent choice for those who love to dine in style! 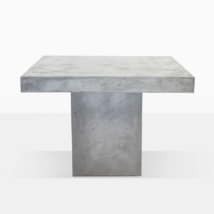 Whether you have a modern home or something more traditional; the Raw Concrete Tapered Outdoor Dining Table walks the line between contemporary and classic, fitting into any space! 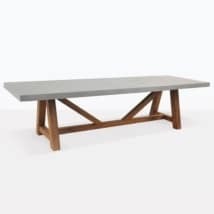 A stunning, smooth rectangular tabletop, balances solidly on two tapered concrete legs; creating an aesthetically pleasing dining table that will be the perfect centerpiece to your space whilst still mixing with different styles of surrounding items beautifully. Whether your space is stark or the chairs are detailed, this table is the perfect mix of simple and bold. Teak Warehouse uses a raw concrete composite, mixed with fiberglass and resin, so while the table looks and behaves like regular concrete, it is lighter, stronger, and longer lasting! 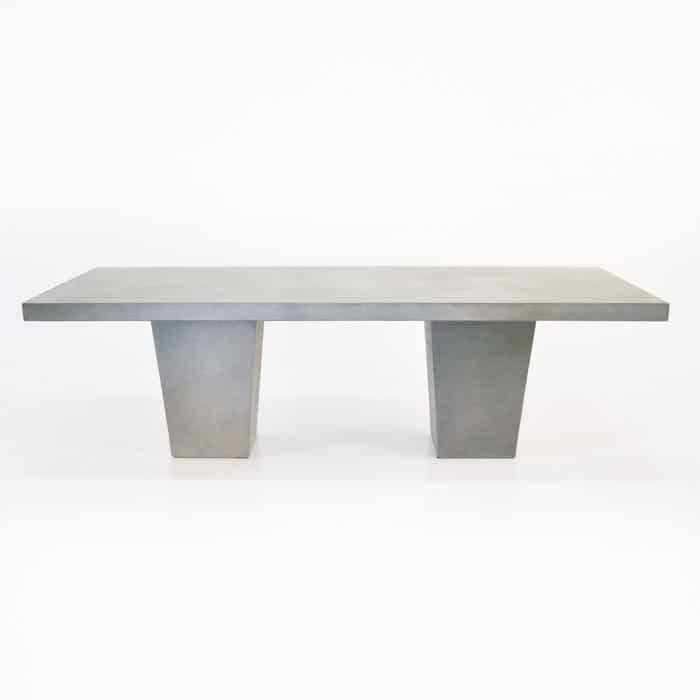 The Raw Concrete Tapered Outdoor Dining Table is available in 3 different sizes so you may choose the perfect fit for your space. Choose a size option below and then all you need to do is find chairs to match! 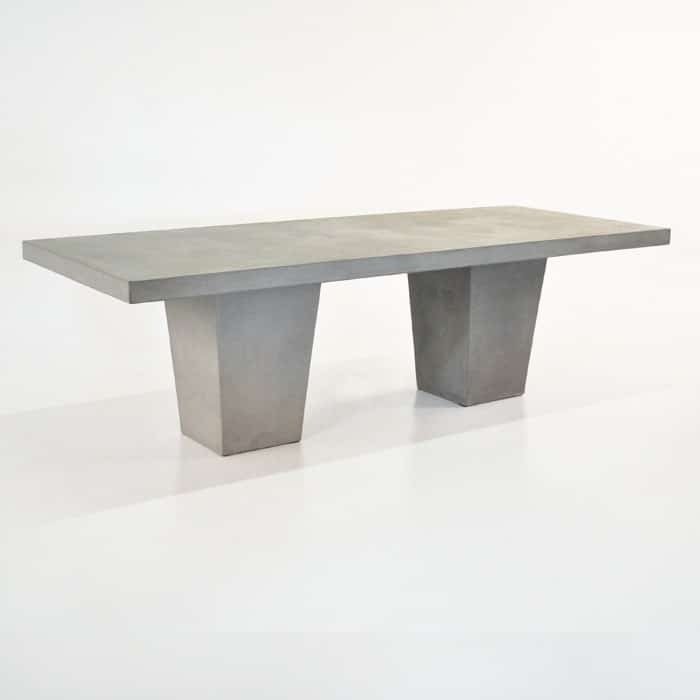 Our raw concrete is easy to clean and maintain; just wipe it down after use – like any other dining table – and you will find your table will weather beautifully outdoors. Concrete is a porous product, so while we do have a light sealer running through the Raw Concrete Tapered Outdoor Dining Table, you can apply another coat of concrete sealant to keep those natural good looks. As well as this beautiful product we also offer #316 Stainless Steel, Batyline® and Textaline® mesh products, Sunbrella®, reclaimed teak and, of course, A-Grade Teak. So pick and choose! Whether you need deep seating or a gorgeous dining set, we have it all! If you need further ideas or inspirations; please call in, call up or inquire online! At Teak Warehouse, we are on hand 7 days a week and happy to help you discover the best collaborations to suit your home! Bring this piece of elegant furniture into your outdoor space. 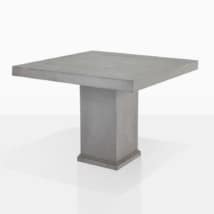 The Raw Concrete Tapered Outdoor Dining Table is designed to withstand any weather conditions while maintaining a fabulous grand appearance; its tapered legs add a geometric flair to this sturdy outdoor table. Mix and match this table with teak, wicker or concrete for your own unique outdoor dining room. If you have a stone or concrete patio, why don’t you bring in a 98” Tapered Raw Concrete Dining Table and frame it with 8 of our Viro® All Weather Wicker Arm Chairs in a thick Sand colored weave; providing a comfortable chair and a satisfying contrast from the industrial hue of the concrete. Or perhaps you want to add a sharp edge to a lush garden or rounded veranda? Obtain a large 117” Tapered Raw Concrete Dining Table and place several of our Raw Concrete Stools in either square or round around it for a modular and chic look that is daring and delightful! Do you have a large family but enjoy a comfortable chair? Never fear! 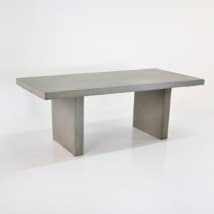 We have a great range of concrete and teak benches. Experiment with a bench on one side and chairs around the rest of the table, keeping your look eclectic and ensuring you have room for those big family dinners! The Raw Concrete Tapered Outdoor Dining Table is designed to create a communal space that everyone can enjoy. What are you waiting for? Order yours now!